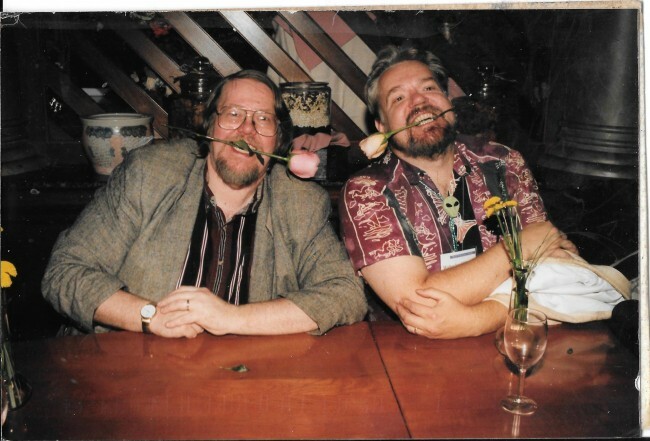 Here’s a photo of Gardner Dozois and me, taken quite a number of years ago. I believe we are at a signing or other function and no one else showed up, despite our tempting passers-by with our manifestly seductive appearance. Gardner passed away a few days ago of complications from an infection. He was 70. Gardner was a writer, critic, anthologist, and the editor for many years of Asimov’s Science Fiction. As an editor, he won no less than 19 Hugo Awards. Asimov’s got me award nominations and respect. Stories published by Gardner accounted for five of my Nebula nominations, four Hugo nominations, and my one and only World Fantasy nomination. And those of my stories originally published elsewhere, and subsequently nominated for awards, were assisted by Gardner’s reprinting them in his massive annual Best of the Year collections, where in many cases they attracted more readers than on first publication. Gardner was dedicated to finding and publishing new talent, and he published the first stories of dozens of writers, and nurtured their careers. His 18 years as editor of Asimov’s marked an epoch of science fiction comparable only to that of John W. Campbell. His taste, discernment, and his long term as an editor were an influence on the entire field. His knowledge of science fiction and its history was profound, and he knew personally most of the important personalities of the genre. As a raconteur, he shared that knowledge with anyone willing to listen. I last worked with Gardner on his Book of Swords, which appeared last October. His thirty-fifth Best of the Year anthology will arrive in July, and is available for pre-order wherever fine books are sold. To get to know the man, try Being Gardner Dozois, a book-length interview conducted by Michael Swanwick. Or better yet read some of his collected works, Strange Days, Geodesic Dreams, or Slow Dancing Through Time. He was there at the start of my career, and helped to shape it, and the genre that defined it. I’m not quite sure where we will all go now that he’s gone. Gardner plucked my first story out the slush at Asimov’s and changed my life forever. After that he bought almost everything I sent, until he left Asimov’s. He also got that first story on the Sturgeon short list and included it in his Year’s Best. To the extent that I have a career at all, I owe it to Gardner. If it hadn’t been for Mr. Dozois, I never would have become a reader, and fan, of your novels. I’d read “Days of Atonement” and “Hardwired” back when they came out, but then you just seemed to disappear. His selection of “Investments” for YBSF22 is how I learned of your more recent writing; I never would have seen the Dread Empire’s Fall trilogy or the Dagmar Shaw trilogy without him. Same goes for Michael Swanwick, with “The Dog Said Bow-Wow”. That’s a very long time ago, that photo. And Oz, neither of us changed a bit. Previous post: A T. Rex is Reading My Mind!